The Ancient Uprising has been put down and a fragile peace again holds in the galaxy. All of a sudden everything changes. Several new factions rise to disturb the status quo. The Unity nanomachines bend energy and matter to their will. The Shaper ships tear the spacetime fabric apart, while insignificant Octantis factions take a developmental leap after leap forward. It almost seems like the base laws of the universe no longer apply. This expansion introduces several new mechanics, such as Time Distortion, Evolution and Anomalies, as well as several new Rare Technologies, Developments and Discoveries. There are two new player boards with three new different alien species to choose from. Due to the modular design, you can use all of these additions or just some of them in any game of Eclipse, according to your preferences and play style. The expansion does not require the Rise of the Ancients expansion, but it is fully compatible with it. As the shadows unfold from the rifts of spacetime, can your civilisation stand unbroken? 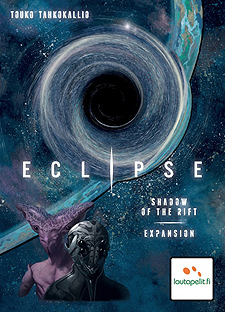 This is an expansion and requires a copy of the Eclipse base game to play.